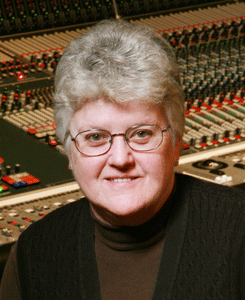 Leslie Ann Jones has been a recording and mixing engineer for over 40 years. Starting her career at ABC Recording Studios in Los Angeles in 1975, she moved to San Francisco in 1978 to accept a staff position at the legendary Automatt Recording Studios. From 1987 to 1997 she was a staff engineer at Capitol Studios located in the historic Capitol Records Tower in Hollywood. In February of 1997 she returned to Northern California to accept a position as Director of Music Recording and Scoring with Skywalker Sound, where she continues her engineering career mixing music for records, films, video games, television, and commercials, and has added Record Producer to her list of accomplishments. Leslie has 4 Grammy statues, winning 2 for Best Engineered Album, Classical in 2011 and 2016 respectively and has also been nominated for Best Surround Sound Album.